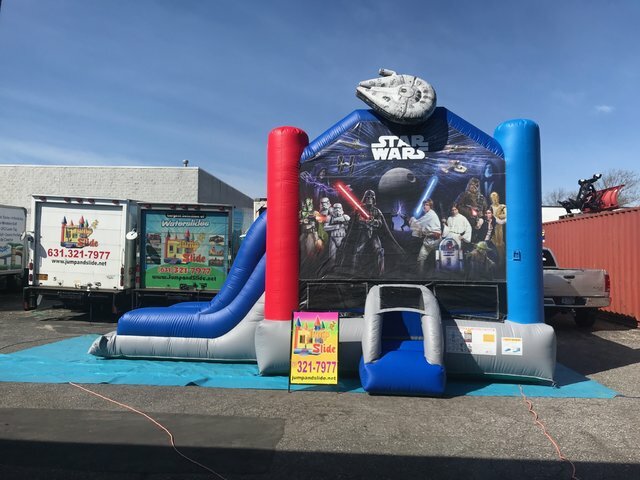 Coming from a galaxy far, far away.....Jump And Slide introduces STAR WARS bounce house rental on Long Island.. It has plenty of space for up to 8 Jedi Knights at a time to bounce, hop, skip, and jumparound to their heart's content. Star Wars jumper inflatable rental was Made in the USA with premium materials by master craftsman, the STAR WARS bounce house is designed with fully licensed digital artwork and a unique Millennium Falcon embellishment up top. It is an epic ride that is suitable for all occasions. This inflatable is compliant with the ASTM's revised standards (F2374-17) with additional safety features such as a safer entrance/exit ramp and emergency exit.